Gender gaps and inequities are especially prevalent in coffee-producing countries, which means that farmers around the world are not producing to their fullest capacity. On smallholder farms producing 80% of the world’s coffee, men and women often have specific roles on the family farm. Women typically do the majority of the work that directly impacts quality and yields while men control transporting and selling. Despite the importance of plant care, harvesting, processing and sorting to a better, more quality-centered coffee-growing business, women are often excluded from decision-making processes. Furthermore, they have less access than their male counterparts to vital resources, including adequate remuneration, land, credit, agricultural inputs, training, information and leadership opportunities. Women play critical roles throughout the coffee process, however men most often capture the resulting income. Coffee companies and leading development agencies alike agree that addressing gender inequalities is key to ensuring the future of coffee and improved well-being. Promoting gender equity within the coffee sector improves the viability of smallholder coffee farming as a family business and prepares more women as well as men to better meet industry demands. Increasing women’s participation in parity to men's participation in supply chains can also lead to significant improvements in crop productivity and quality, as well as global food security and poverty reduction. As the coffee industry benefits from greater transparency and consumers are more focused on how their coffee is sourced, inequities between genders are an increasing risk in the value chain. With multiple crises threatening coffee supply and improved production, the gender gap is not only risky, it is unnecessary. Industry has the power to engage the full capacities of female and male farmers to address both industry profitability and human rights. A sustainable coffee sector demands gender equity. 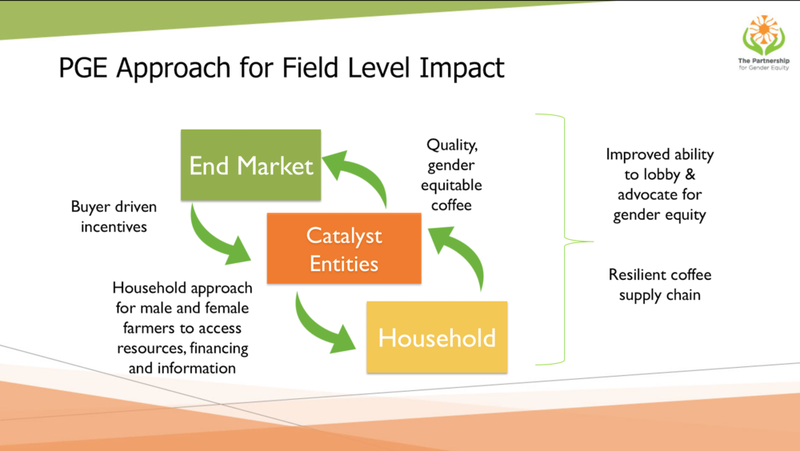 In response, the Partnership for Gender Equity (PGE) is creating common tools and methodologies to support the coffee industry’s engagement and investment in gender equity across the value chain. These tools will serve to improve the livelihoods of producers and enhance the sustainable supply of quality coffee. Our approach comprises three stages: starting with scientific research, moving into strategic pilot projects and tool creation, and finally leading to our support of scalable investments throughout the industry. By harnessing the power of collective action within the industry, growers, buyers, exporters, importers, roasters, private foundations, development agencies, academic institutions and more can create a positive impact from community to cup, and for every step in between. Read more about PGE's PILOT PROJECTS and TOOLS FOR GENDER EQUITY. PGE’s Theory of Change highlights the importance of working at varying levels of the supply chain. By focusing on inequalities between genders, starting with the most vulnerable sector (smallholder farmers), industry actors are able to shift power dynamics in households and positively influence behaviors. As family farming becomes more lucrative, men and women must learn to share responsibility and decision-making in order to increase household productivity. This will increase the value seen by and commitment of producer organization to invest in gender intervention. As such, their competitiveness will increase as gender equitable approaches become more incorporatedinto their own policies and practices. As a result of this transformation, the end market will become even more mobilized to work with gender-equitable businesses and organizations, building incentive structures into their own supply chain and investing in collaborative approaches to gender intervention. This begins the cycle anew of more empowered households and producer organizations.